Inlet/outlet on an axis of 90°. The flushing valve opens and pressure is released from the hydraulic piston, then water flows outside through the flushing valve. 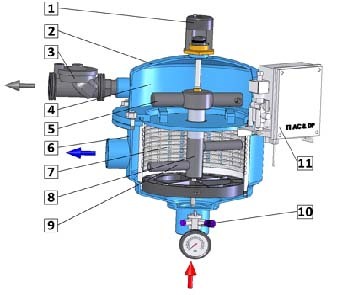 Pressure in the hydraulic motor chamber and the dirt collector is significantly lowered, the dirt collector nozzles movement and rotation cleans the screen’s entire internal surface. The flushing cycle takes 5 seconds. The flushing valve closes at the end of the cycle and the filter is clean. During the whole process, water supply is uninterrupted.